Review posted March 20, 2018. Quirk Books, Philadelphia, 2014. 168 pages. 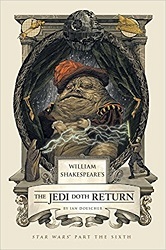 This third volume in William Shakespeare’s Star Wars was published quite some time ago – but I finally finished reading it because my son graduated from college and is living with me again for awhile. These books simply must be read out loud! I loved the way my son did the various voices – It’s awfully amusing hearing Darth Vader and the Emperor speak in Shakespearean English. I think my own Chewbacca voice isn’t too bad. Ian Doescher knows his Shakespeare. There are many references to Shakespeare plays in the text – most of which, I’m sure I didn’t pick up on. We read one act at a time – which ends up being approximately a half-hour of reading, just enough that our voices didn’t get too tired. I grant you there aren’t a lot of female parts, but we mostly alternated characters. There are Five Acts, so once we got restarted (We read Act One months ago. ), it took us about a week to finish. I still say these would be magnificent plays for a middle school to put on, or for a middle school or high school English class to read aloud in conjunction with studying a Shakespeare play. There’d be plenty of food for discussion about Ian Doescher’s adaptation, and I’m guessing students wouldn’t complain about the archaic language when they already know the story. This is another brilliant installment. I admit I was losing steam and wasn’t sure I was going to get it read – but the opportunity to read it aloud reminded me what fun this series is.